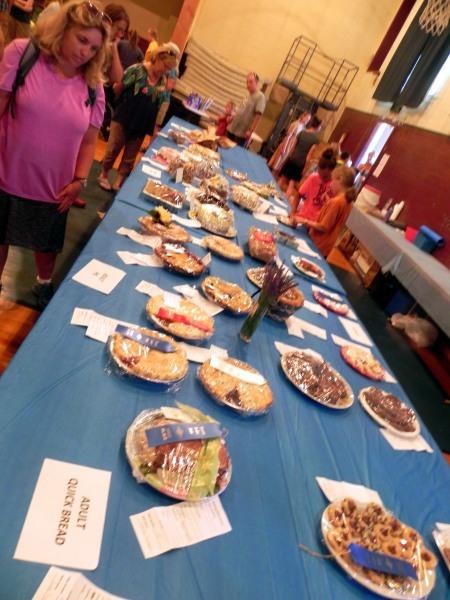 Our baking contest features high emphasis on quality rather than quantity, and fea­tures prizes as well as ribbons. Because the baked goods are “World Famous” they are auctioned off Saturday afternoon in the World Famous Auction. Judging: Entries will be judged for taste, appearance, and quality. Each contestant may enter as many items per category as they like, in any or all categories. All plates and dishes will be sold with your baked goods at our World Famous Auction, so please don’t enter your cake on Granny’s heirloom cake platter! Please do not enter any perishable items – cremes, custards, cream pies, mousse or any other items that must be refrigerated. THERE WILL BE SIX (6) CATEGORIES OF BAKING: Cakes • Pies • Yeast Bread • Cookies • Quick Bread • Candy. Muffin entries should include at least eight (8) samples. Candy and cookie entries should include at least twelve (12) samples of uniform size and color. Blue, Red, and White Ribbons for each division in each category. One of the blue ribbon entries will be selected by the judges as the Best of Show and will be awarded a rosette. Ribbons and the rosette are worth points toward some great prizes. Adult Division Grand Prize: (Thanks to Little Mountain Hardware): A heavy duty 5 Quart KitchenAid Mixer (your choice of color), or a $200.00 gift certificate from the hardware store. Other Prizes: Just wait ‘til you see the other prizes. They’re sure to delight the recipient. ****We are asking former Grand Champions to donate their winning entry or an entry of their choice to our auction. Thank you!